Soon after WWII, an American family moves to India. Jewish-American Martin has returned to his studies in Indian history after fighting in Europe, and has won a Fullbright Scholarship to continue his research there. Britain is preparing to grant Indian independence, including partitioning the country into Hindu India and Muslim Pakistan, and the family are staying in a village near Simla, near the proposed borders. Martin will be documenting the end of British rule. Martin’s wife Evie and their 5 year old son Billy come too, and Evie tells us her story in a first person narrative. She is keen to participate in a new adventure, and anxious to hold on to her marriage to a man troubled by his recent experiences. She finds a cache of letters between two women, written in the 1850s, and gets caught up in the story of two very close friends, Adela and Felicity – the letters leave Evie with some huge questions and she sets out to find out the answers. The story of Adela and her friend Felicity is told partly through the letters but also in a third person narrative. I found both the 20th and 19th century stories interesting. I really like historical fiction and having several stories (and time periods) revealed in one novel is a bonus. 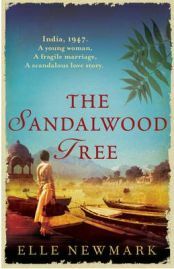 The Sandalwood Tree is nearly 500 pages, but it is a quick and engaging read. India in the novel is portrayed through the perceptions of two Western women, 20th century American Evie and 19th century English Adela. Evie describes in some detail the appearance of the rented bungalow that is to be the new family home and the surrounding village, and people including servants, their Indian landlord and some English colonials. Elle Newmark also describes the food that Evie and Martin eat, having decided to try to eat Indian food rather than the English nursery food the British colonials have. I found the 20th century story more memorable than the 19th century one, but the 19th century story is a moving and emotional tale of rule-breaking romances including lesbian relationships. However, Evie’s first person narrative has more immediacy and is more dominant in the novel. I liked Evie’s character a lot, open minded, always looking for a way to relate to the variety of people she meets, and anxious about having servants and about offending them. I do have some reservations – I don’t believe a white American couple, even one in a mixed marriage (Evie is from a Catholic background, would have been quite so liberal and anti-racist in their outlook and I think maybe the author modelled Evie and her attitudes a little too much on herself. The best historical fiction involves engaging with the mindset of the time – even unconventional and rebellious characters will still be influenced by their society. Although she doesn’t quite get under the skin of her characters, this is a terrific easy read and I really enjoyed it. An extra bonus in the edition of the novel I read is an interview with the author in which she discusses the historical fiction genre, the factual background of her story and the history of Partition, religious divisions in India, Indian food, travel and living in different places, and the Jewish uncle who fought in Europe in WWII. I love to know about writers’ thoughts and influences for their writing. This is also valuable because sadly Elle Newmark died earlier this year – she was struggling with the disease that killed her while writing this novel, her second. I received a review copy of this from Transworld. No Comments on "The Sandalwood Tree"